I have finished updating the book’s content to work with FullCalendar 3.9. If you buy the book now you will receive the content and code based on FullCalendar 2.6.1 and FullCalendar 3.9, which includes new topics such as using SweetAlert2 pop-ups and Bootstrap4 themes. Two book versions for the price of one. As always, this update will be free if you already bought the book. Thank you for your support. 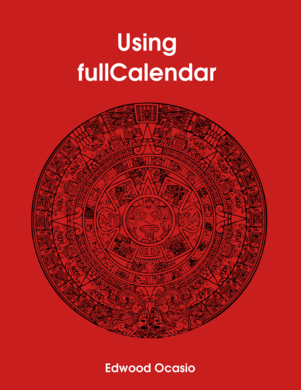 If you buy the book now you will receive the current version based on FullCalendar 2.6.1 and the updates to the new version based on FullCalendar 3.9. Go to the book page for more information. Just published a new version of the book with a chapter about how to set recurrent events with fullCalendar. If you already purchased the book you will soon get an email with the updated book and resources. If you want to get the book or download a sample visit the book’s page. I will start working in a new version of the book based on the latest fullCalendar version. Current readers will receive these updates free as always. Just made available a site license to share the book content and resources in a private intranet for up to 5 developers. However only one email will receive the updates. Contact me if you want to give access to a bigger group of developers. 1. New chapter showing how to use external widgets to manipulate a calendar instance: datepicker for navigating and checkbox for filtering. 2. Added code in the database persistence samples to save updates when resizing or dragging events. 3. Fixed bugs in code samples from the database persistence chapter. Also updated Web2py sample project with those fixes. Buyers from previous versions will get these updates for free. Interested developers can get their own copy and future updates will be free. The price will increase again in a few days when I publish this version. This version is already published. As always, previous buyers will not be affected by this and will receive these updates at no additional cost. You can take advantage of the current price if you get the book now. Just finished the chapter on the basics of how to use a database to manage fullCalendar’s events and you can buy the new version now. The actual code to save to or retrieve events from the database depend on your back end: libraries, framework or database. The samples in the book are just to give you an idea about how to build the interaction with your back end through JSON. I plan to extend this chapter with examples showing how to save events to a database after drag and drop actions. Although I think that, after going through the examples in the new chapter, you will readily get the idea on how to do it. It is a matter of choosing inside which fullCalendar’s callback to put your save, update and delete functions calls. As announced before, the price increased again for new buyers. If you already bought the book you should be receiving soon an email with the updated materials at no additional charge. If you have not bought the book yet, get it at the current price and receive future updates for free. This book contains sample code, advice and warnings about developing solutions with fullCalendar. It will save you lots of "Google time". After buying you will receive free upgrades. Using fullCalendar Blog at WordPress.com.